According to experts, 84% of communications will be visual by 2018. In addition to this, contents that have images also have 650 percent higher engagement than text-only contents. This is proof that the online world has become visual more than ever. The bottom line is that visuals matter in today’s World Wide Web. And yes, visual graphics flood the internet whether in the form of infographics or even in the simplest form of a meme. And since visuals play a huge role in your marketing, it is always imperative to take it seriously. In reality, we believe that content shouldn’t just be isolated in written form. 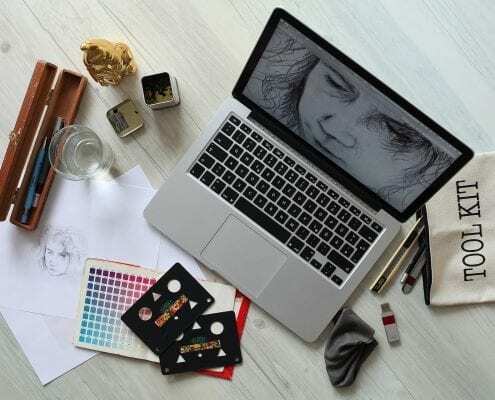 Graphic designers have contributed in providing visual content that affects how consumers purchase products and even how they perceive certain brands. Visual graphics improved the overall experience of web users whether in understanding a company’s message or in appealing to emotion. If you need the help of graphic design experts that can provide you with all your marketing and advertising needs, you’ve come to the right place. We offer superb graphic design services. With experienced and highly talented graphic designers in our team, we can provide you with different types of services including graphic design services for your logo, branding, t-shirts, posters, or social media materials. We provide an easy-to-follow process in order to get the correct graphic design solution to our clients. We take pride in providing fast solutions that fit individuals and organizations of all sizes. Our process starts with a consultation. We will ask you about the things that you want to see in your graphic design project. Regardless if it is for your organization’s branding material or an actual product that you are currently developing, we make sure to listen to what you have to say. After getting all the information from your part, our team of graphic designers will do their research in order to make sure that the design meets your taste and expectations. Once everyone is on the same page, that’s when our graphic designers do their magic. Our graphic design services allow clients to make the necessary visual impact needed in order to become relevant in their niche. And since we have a team of flexible and reliable graphic designers, we offer classic to contemporary inspired designs regardless if it is for your advertising needs or even for your branding. What makes us different from our competitors is our dedication to graphic design. You can also guarantee that our works are among the most competitively priced in the market today. You don’t need to extend your budget just to have the visually appealing material that you need for your campaign. We also specialize in making designs that have to be printed. Despite today’s digital age, we make sure that you also get a design that looks good when printed on different mediums whether on paper or even on fabrics. Are you lagging when it comes to your visual content? Feel free to contact us for more information about our services.